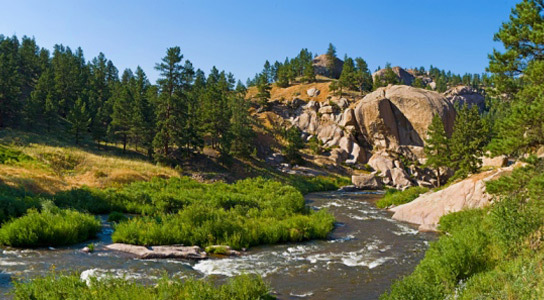 In the Rocky Mountains, the South Platte River system flows east through the Coloradan plateau that has plenty cattle ranches, sheep pastures, dairy farms, and water treatment plants. A new survey shows how human activities have affected the concentrations of antibiotic-resistant genes in the watershed. The researchers published their findings in the journal Environmental Science & Technology. Two integrons, genetic elements that can be traded between microbes or persist on their own, called sul1 and tet(W), confer resistance to sulphonamide and tetracycline antibiotics, which are two classes of drugs used in both humans and animals. Over a year, the scientists sampled ten different sites in the watershed, including upstream areas and those downstream of human activity. They characterized 89 water treatment plants and 100 animal-feeding operations that feed into the river. The South Platte receives treated waste effluent from cities like Denver, and in the driest months, its flow is can be dominated by it. The sul1 antibiotic genes were 1,000 to 10,000 times higher in human-affected sites than in the natural areas of the watershed. There was also a linear correlation between sul1 concentrations and the location of wastewater-treatment plants and animals upstream. However, there wasn’t a clear correlation between tet(W) and human activity. Nor did tet(W) concentrations match previous measurements of tetracycline antibiotics in river sediments. The hypothesis is that sul1 are more readily taken up by bacteria in the environment, whereas tet(W) is more limited. Resistance genes can occur naturally in the environment, but the issue is quite complex. Treated effluent waters are more widely used in regions that have scarce water resources. Be the first to comment on "Antibiotic Resistance Genes Found in a Colorado River System"